Drought Has Drillers Running After Shrinking California Water Supply Farmers and ranchers, increasingly reliant on pumping groundwater, are desperate to have more and more wells installed. This frenzy could deplete California's aquifers, experts say. Juan de La Cruz operates a drilling rig that is probing for groundwater 2,500 feet beneath Fresno County. Steve Arthur practically lives out of his truck these days. He runs one of Fresno's busiest well-drilling companies, and hustles up and down the highway to check on drilling rigs that run 24 hours a day. "It's officially getting crazy," Arthur says. "We go and we go, but it just seems like we can't go fast enough." Drilling in California isn't just for oil and gas — it's for water. And during this severe drought, farmers and ranchers are relying heavily on pumping groundwater. 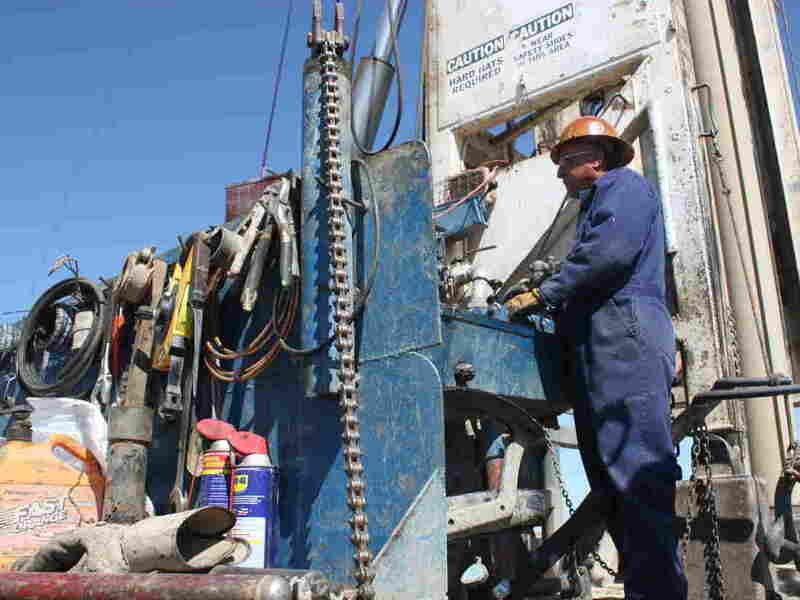 Counties in the farm-rich Central Valley are issuing record numbers of permits for new wells. But the drilling frenzy could threaten the state's shrinking underground aquifers. Arthur says he's lucky if he gets three hours of sleep a night. "There is just so much going on with these crews running through the night that there's always a problem someplace," he says. Arthur says his company has an eight-month waiting list. "It's just amazing, the amount of people that call and want wells. A customer called me this morning and I'm supposed to do two for him, and he said add 14 to the list," Arthur says. Farmer Matt Fisher has been scrambling to keep his orange trees alive after learning he won't get any water this year from federal reservoirs. "You have to literally grab these guys and drag 'em to your property and say please, please drill me a well," he says. "I've even heard of drilling companies that won't tell growers who's in front of them, because guys are even trying to buy the other guy's spot in line; if ... you have to pay a guy $10,000 for his spot in line, that's cheap compared to what you're going to lose if you lose your whole orchard." It's not always about losing trees. Right where a brand new almond orchard will be planted, a drilling rig bores a hole in the earth 2,500 feet deep. All told, this well will cost the farmer about $1 million. Juan de La Cruz works on this rig 12 hours a day, seven days a week, carefully guiding the drill bit. He often stands in a little shack next to the drill hole that they call the doghouse — where workers keep a log of the layers of sand and clay they find. Two other essential pieces of gear: a microwave and a fridge. "We've got some cactus and zucchini in here to cook up," says de La Cruz. "The farmers bring us cantaloupes, tomatoes, whatever we want. They're so grateful, because when we're done with this well, these fields will have water." Bob Zimmerer, who owns this rig, says California's drought is profitable for well drillers, for now. "I mean, we can't keep sustaining this amount of overdraft, we all know that. At this point in time, we don't want to keep on going on at this pace. It's more of a temporary fix," Zimmerer says. That's a sobering admission from a well driller. California's aquifers supply 40 percent of the state's water in normal years; but in this drought year, it could be as high as 65 percent. State officials estimate that water tables in some parts of the Central Valley have dropped 100 feet below historical lows. Groundwater pumping could also put more stress on the San Andreas Fault, which has moving plates that can cause earthquakes. And those aren't the only consequences. "We're on a one-way trajectory toward depletion, toward running out of groundwater," says Jay Famiglietti, a University of California hydrologist and a leading expert on groundwater. He points out that California is the only Western state that doesn't really monitor or regulate how much groundwater is pumped. "So it's not unlike having several straws in a glass, and everyone drinking at the same time, and no one really watching the level," Famiglietti says. That could change. A bill making its way through the California Legislature could begin requiring local agencies to track, and in some cases even restrict, groundwater pumping. Some farmers oppose it, saying it's a violation of their private property rights.